I love sharing new and exciting products with you and I am thrilled to share this rather unique unit created by a great Aussie business called Stuff Masters. 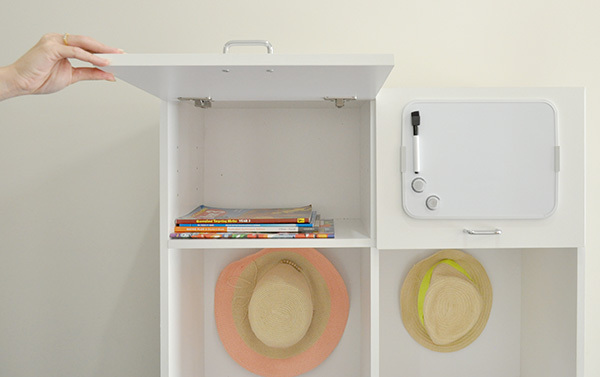 The story behind this fab unit is beautiful… Stephen and his wife have 4 kids, Mrs Stuff was searching for a way to keep all the kids ‘stuff’ organised, but couldn’t find the right product. Mr Stuff sweetly listened to his wife (yep, he listened!!) and he made a Launch Pod, perfect exactly what Mrs Stuff wanted. Stephen now sells his LaunchPods Australia wide. I love it when a clever idea turns into a business! Thanks to Stuff Masters I was given the opportunity to install a DuoLaunch Pod into a local readers home. My hubby put together the Duo Launch Pod for me. It took him approximately an hour, wasn’t too hard at all. It comes with easy to follow instructions with each Pod. It fit easily in the back of my car (7 seater, folded down seats) so I could then deliver it to the lucky reader. 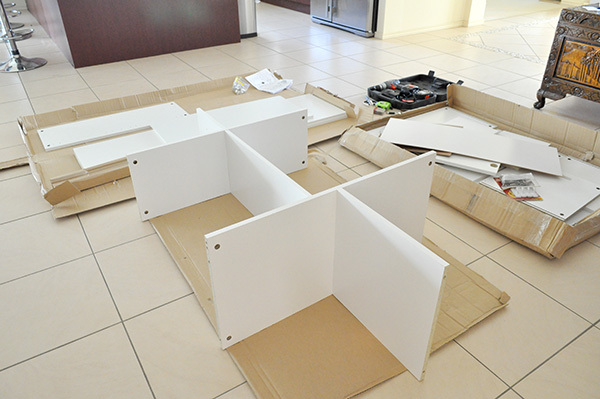 The cabinet itself is made from melamine faced particle board, which is easy to wipe over and keep clean. There is a great variety of bright and pastel colours available to choose from, view colour selection here. This pack comes with everything you need to have an organised set up. 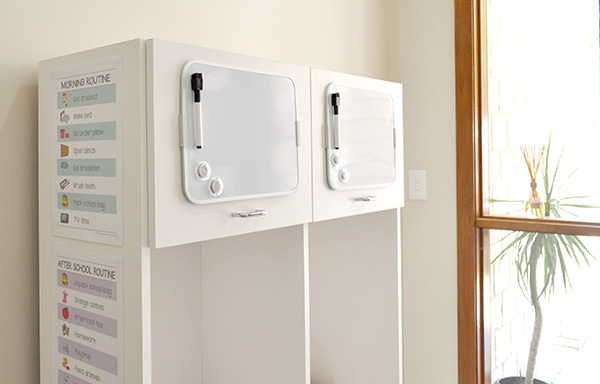 It includes a whiteboard for each Pod, with magnets and whiteboard marker. This whiteboard is handy for adding notes about what is happening on what day or reminding kids to pack particular items like their gym gear or even a sweet little note to inspire them through the day. 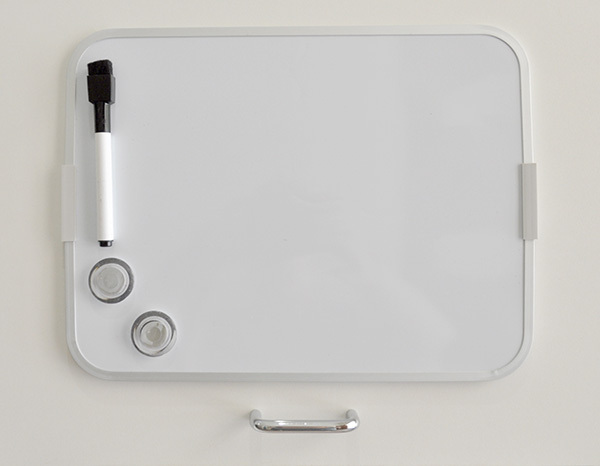 The white boards are attached using the provided double sided tabs. 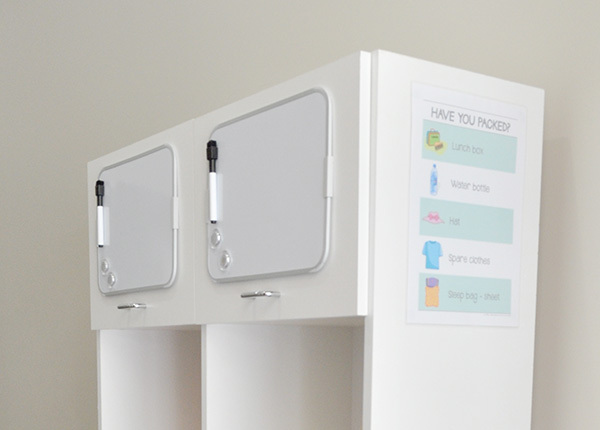 It comes with removable hooks which are perfect for holding hats or library bags, you can place these wherever suits you on the pod. 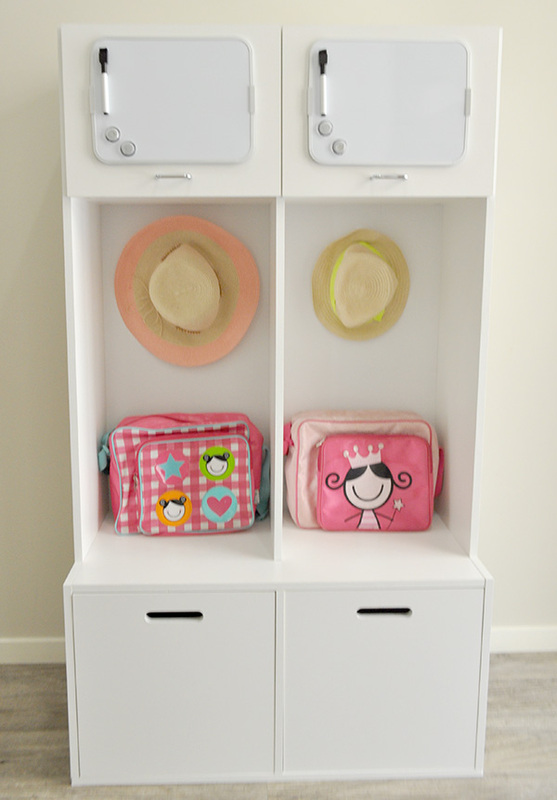 As most kids school bags are so heavy these days with text books and homework etc I found the best option was to use the hooks provided for hats that the kids play in the backyard with and leave their school bags sitting on the LaunchPod. School hats always stay in the kids school bags so they don’t forget them. The cubes in the bottom of the LaunchPod could be used for many different things, sports bags, sporting equipment, lunch boxes, jumpers or shoes. Finally, because I am a fan of charts, I wanted to incorporate some routine charts into the LaunchPod, so I added them to the side of the Pod. Stuff Masters LaunchPods are available for delivery Australia Wide. Visit their website to view more details and order. This is a sponsored post, run in accordance with my disclosure policy. What a brilliant idea! Although I don’t know if I’d have them in the hallway-as they aren’t very attractive- maybe in the garage? Extremely practical though-and a lovely story of how they came about though. I agree Isobel, such a sweet story and he listened to exact what his wife wanted. 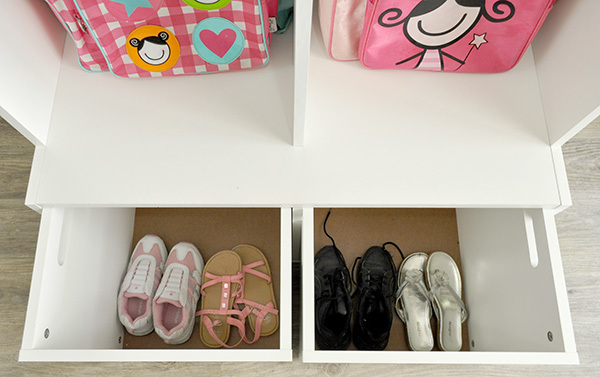 The garage would be the perfect place, or even in the kids bedrooms to store books and hand school uniforms from too. That is such a great idea. I love how you’ve added the charts so it is like a command centre for the kids! 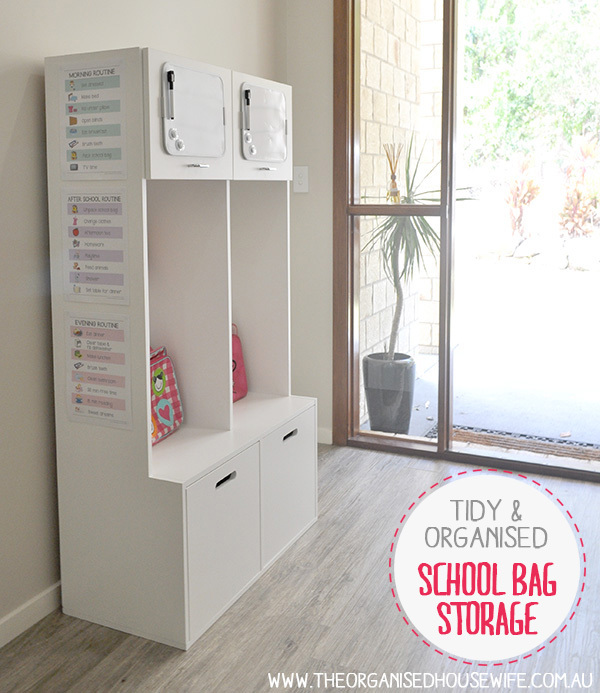 It’s a great little centre, you could also remove the charts and put hooks on the side to hang their school uniforms. So many different possibilities! Love this! wish I could get them for in the UK! They are very unique Kelly, I have not seen them anywhere myself either before StuffMasters contacted me and made me aware of them. These would be perfect for my two little boys, shame you can’t get them in NZ. Such a pity Megan, have you contacted StuffMasters, see if they can help out at all?? These are very clever – wish I’d had these when my kids were all little. I would have them in their bedrooms next to their study desks – that way they have access to the books they have to lug to and from school. Susan, that’s a great idea, we were trying to decide between the front entry or next to the kids beds, we decided front entry to tidily store all the shoes and there was enough space needed. How perfect! This is exactly what we need. Cherie, I asked them same thing when I was setting up and the reader mentioned she purchased them a few years ago from Dreamworld. that’s a great idea mone, they could be used for so many different things. If I had more room in my garage I would like them for the kids sports gear! 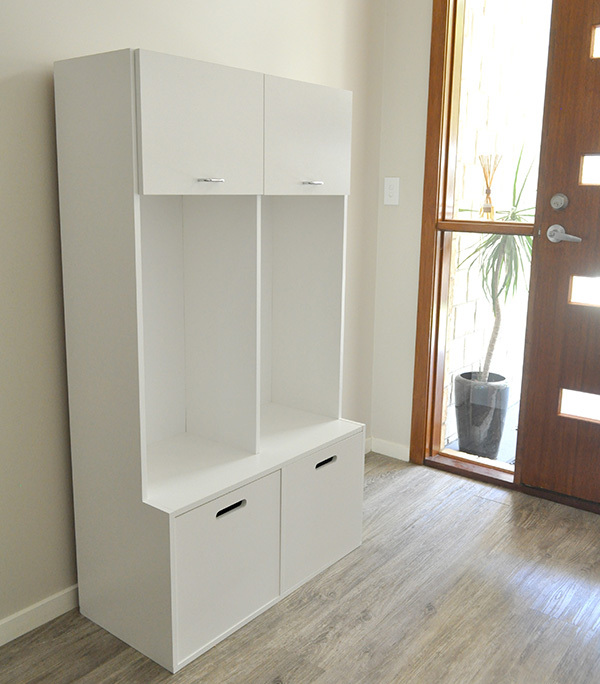 Great idea – an extra would be a small side cupboard for bats, hockey sticks etc. Gorgeous design love it. It’s very clever isn’t it Kylie! This post is fantastic Katrina. I just love the launch pad. I am forever tripping over school bags when I walk through the door. 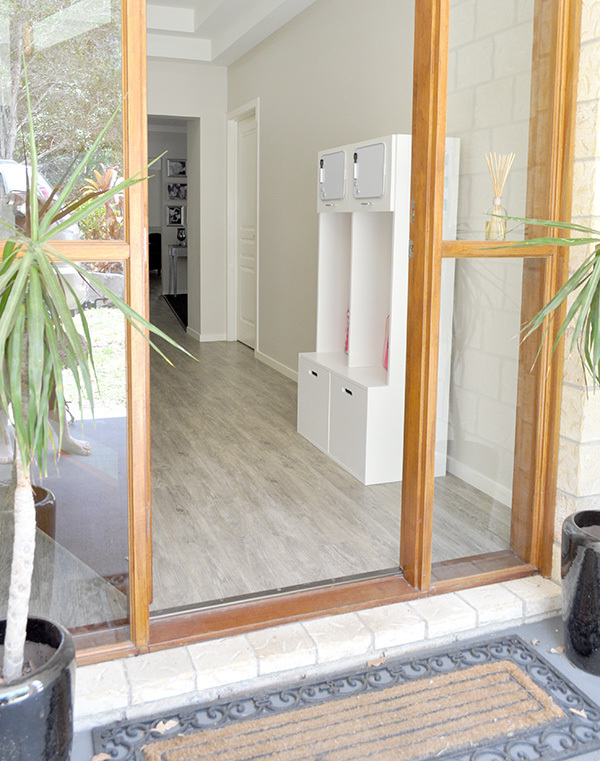 It is such a great unit, keeping everything beautifully tidy!